I previously had VX 2.5.6 working great, and I downloaded and set up VX 3.0.0 identically to my previous install (I used the setup guide found here). What I'm encountering is that I can see the Grub loader, and part of the boot process, but then it goes to a blank screen with a flashing cursor. No login prompt, or anything. It just sits there. I redownloaded the file, double-checked the file sizes and sha1sums, and they're identical. Any ideas what I've done wrong? Andrew, just saw your piece here --> https://www.sdxcentral.com/articles/f... Very cool! I haven't done a lot with KVM directly, I'm typically working through Libvirt as the orchestrator to drive KVM/QEMU but I can take a peek and ask around. Which mechanism are you using to login... the serial console? Yup! 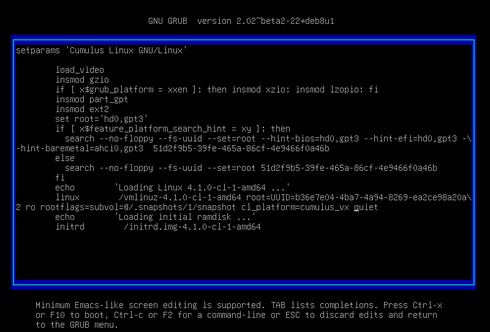 I followed that guide to getting the KVM image working in GNS3, and 2.5.6 worked great! I've tried using TightVNCViewer and Telnet (with gnome-term and SecureCRT ) for the VX 3.0.0 instances, since I run GNS3 in Linux Mint, but it's been a no-go, since I installed 3.0.0. Oh cool! Thanks Eric! I'll add a MicroCore VM I have to a topology, and then try this out. 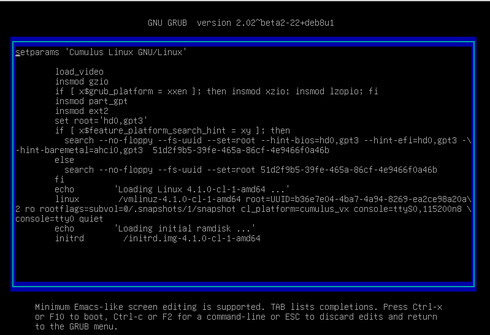 If everything pans out, I'll fire up 3.0.0 outside GNS3, so I can use it to create a baseline VM. BTW, I'm really excited to check out that ONIE install simulation feature. I could only watch David install the image on a physical switch, so it'll be fun to at least pretend like I can install the OS! Another thing that's cool is that there is nothing pretend about it... we have separate VX binaries that can be installed now too so the install is real and functional. It should also be possible to just wait a bit (~60 seconds) on the serial console and get a login prompt there. Hmm.... I think I'm doing something wrong here. I interrupted the boot process, and removed the console references, but it's still booting into that blank screen. Any idea which part I failed to delete? But after about 50-60 seconds, I'd reach the cumulus login prompt, and could proceed normally. I've seen something similar happen with Extreme Networks virtual EXOS VM (it gives a coreDumpWrite error), which one of their engineers confirmed wouldn't effect operation. Is this the case here, as well? I'm having the same issue. I'm trying the Vagrant box version but I'm trying to run that image interactively in VirtualBox to troubleshoot the problem. Blank screen after boot loader prompt. I've tried removing console references to ttys0 and ttyS0 with no luck. The symptoms with vagrant up are timeouts when trying to ssh.